Comox artist Naomi teWinkel is as quirky in life as she is in her creations…. Somewhere in Union Bay there is a towering fir tree that owes its existence to a whimsical and tenacious little girl. Flash back to the early 1980s. Naomi teWinkel (nee Katovic) was about eight years old when she was told that the forested area behind the family’s home in Union Bay was scheduled for logging. Distressed that all of the trees would be cut down, ampoule she hurried over to Grandma Elsie Katovic’s home next door to lament about it and, shop very likely, be consoled with home-baked cookies. Fueled with enthusiasm and sugar, Naomi went home and wrote a letter to the loggers. On it, she drew a picture of a broken heart on a crying tree. She tacked this colorful masterpiece on her favorite fir and hoped for the best. With her love of trees and zest for life it comes as no surprise to discover that the home Naomi now shares with her husband, Nico teWinkel, and Kitty Cat PAL rescue cat, Charlie, has a backyard full of tall trees. And, after almost a decade of what Nico describes as ‘extreme gardening’, the entire yard is reminiscent of a Dr. Seuss storybook. There is a giant chessboard, a serenity garden and a stand-alone red door to the forest… that takes you to, quite literally, a (pitch) fork in the road and other delightful discoveries. The .6-acre yard is a fantasyland with zany metal art sculptures created by Steve Katovic, colorful signs and art created by Naomi, and an eclectic assortment of odd and unusual trees, shrubs and flowers planted by Nico. 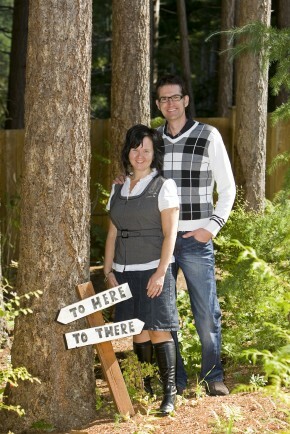 The home, on Mulberry Lane in Comox, has been affectionately named mulBerryLand. It doubles as the couple’s residence and home-based offices—both Nico and Naomi are computer experts. Naomi also has a small art studio in a separate building and they have created a unique guest suite over a detached double-garage. Their bed and breakfast guests enjoy a view of the spectacular mulBerryLand garden from a private balcony. As I sit in the teWinkel’s family room, I am intrigued by how they have integrated the same artistic sense of fun and adventure inside of their home as they have in the garden and the guest suite. The kitchen appliances are about the only items that are ‘normal’. Naomi’s colorful canvases and paper maché sculptures grace each room; area rugs and furniture feature bold colors and wild patterns; even Charlie is extraordinary as he saunters around like a clown in a cat suit looking for a party. Naomi was born and raised on Vancouver Island. She attended Union Bay Elementary School, Cumberland Junior High and graduated from GP Vanier Secondary School in 1991. Although she was creative, she was not necessarily artistic at school. Aside from an art class or two in junior high, she has never had any formal training. Her flair for the unusual was evident from an early age, however, as she was not afraid to wear bright colors and bold patterns, often pairing pink with red, much to her mother’s dismay. Nico was born in Gelderland, the Netherlands. His family moved to Canada when he was 10. They settled in Hythe, a small town in northwestern Alberta. By the time he graduated from high school, Nico and his three older brothers had had enough of snow and cold winters. One by one they moved to the Comox Valley. His parents and younger sister followed soon after. Nico enrolled in the computer science program at the University of Victoria, commuting home to the Valley to spend time with family and friends almost every weekend. Nico looks at Naomi and flashes her a huge smile. She smiles back. I can only assume that Steve and Leona Katovic have long-since gotten over their concerns that Nico did not have ‘good intentions’ for their daughter. In 1992, Nico was offered a summer work term in Chilliwack. Even though the couple was already engaged to be married, Naomi’s father made it clear that that he would not approve of her “running away” with Nico. A wedding was hastily arranged and the couple began their life adventure together. Before long, the teWinkels were back in the Valley. In 2000, they both secured employment with the same California-based computer software development company, Versata Inc. Due to the nature of the computer business they were able to live on Vancouver Island and work remotely. This lucrative contract enabled them to purchase land in a new development called Mulberry Lane and build their dream home. Once in their new home, the teWinkel’s soon grew tired of looking at bare walls. Considering that it was more important to buy food than art, Naomi recalled Grandma Katovic’s advice and looked around for a creative solution. The first donated piece was a special commission for the Vancouver Island Persons Living with AIDS Society in Victoria in 2003. Naomi created a colorful masterpiece that showed the earth with a large city popping out of it and an AIDS ribbon to commemorate the Society’s work. The piece didn’t sell—because the people who ran the Society, their clients and volunteers, all loved it so much that they begged her to paint and donate something else so they could hang this piece in their boardroom. Since then she has supported several Vancouver Island organizations including YANA, the Comox Valley Arts Council, Street Smart Kidz, Haiti in My Heart and Kitty Cat PALS Society. As a result of her work in the US, she has also donated to the DrawBridge—an arts program for street kids in California—and Florida’s Yellow Umbrella, an organization dedicated to the prevention of child abuse. Naomi recently made the local news—and secured a place in thousands of family’s personal photo albums—when she completed a special commission for the Comox Valley Exhibition. If you stuck your head through the face hole of the giant farmer cut-outs at the recent Fall Fair you became part of her art! While the majority of her works are originals, she has also replicated works from one of her favorite childhood writers and artists—Theodore Seuss Geisel. Considering that Dr. Seuss’ first book, published in 1932, was titled And to Think it That I Saw it on Mulberry Street, Naomi says that it is coincidental, but kind of amusing, that she eventually came to live on Mulberry Lane. The teWinkel’s double attached garage is a true testament to her love of Dr. Seuss characters. A few years ago, while getting ready for a community art studio tour, the couple cleaned everything out of their garage and painted the walls white, so they could use the space to display art in the event that it rained. Nico should have known that you do not present a blank canvas to an artist! Before long, gaily-painted and larger than life-size Dr. Seuss characters graced all three walls of the garage. Described as “a self-taught, fun-loving artist”, teWinkel’s goal in life is to help the world smile, one whimsical painting at a time. While she has worked hard to develop a style of her own, when it comes to use of vibrant colors, geometric shapes, creativity and flair, her style does bear some resemblance to the brilliance of a Britto. Perhaps, one day, she too will be included amongst a list of masters! Like most artists, she has peddled her wares at various art galleries and art shows throughout the Comox Valley and beyond. Regardless of the venue, her display booth is always one of the most eye-catching. In addition to her paintings, she creates sculptures and sews a line of stuffed toys she calls ‘Mullies—Monsters you want to find under the bed!’ Every single Mullie is unique, gets its own name and eventually ends up in the arms of a child. This winter she also plans to get her hands dirty on a potter’s wheel. Despite their optimism and energy, Naomi and Nico both know that sometimes, reality bites! In 2003, when the ‘dot-com’ bubble burst, they were laid off from their jobs at Versata. Soon after, Nico joined an Australia-based insurance company, working remotely again. After that contract ended, he became a Certified Energy Advisor working for City Green in Victoria. He has recently retired his energy auditing ‘blower door’ in order to return to computers and is now developing mobile applications for iPhones. In addition, he and Naomi operate the B&B they opened in 2005 and they continue to work on a variety of computer-related contract projects, ever watchful for the next big opportunity. With their computer backgrounds, the teWinkels make good use of the internet to market their respective businesses, including Naomi’s art website, www.SuperArtGirl.com. Ever creative, she came up with superhero names for family and friends, too. Nico, whom she says is a safety fanatic, became SafetyBoy. Her best friend became SuperSideKick. She has even written a couple stories based on the Adventures of SuperArtGirl that she hopes to turn into a book or her ultimate dream, a comic strip. If past success is any indication of the future, I would bet money on the fact that one day you will be seeing SuperArtGirl books in a store near you. Her adventure starts by saving a tree and I imagine that with her enthusiasm, dedication and drive—and the support of SafetyBoy—she could achieve almost anything.